Nestled in the lower Himalaya, the tiny northeastern state was gearing for its second international flower show. The roads leading to the sparkling clean capital of Gangtok were adorned with pots of petunia. The main alley of M G Marg came alive with a bloom that perfected in artistic congruity but stopped short of displaying opulence. Using the cold climate to its advantage, Sikkim forayed into commercial floriculture in 2006 as part of the Union Ministry of Agriculture’s horticulture mission for northeastern and Himalayan states. Sikkim’s emphasis is on high value and low volume horticulture crops, which include exotic vegetables, spices and flowers. The state government also has a target of bringing all cultivable land under organic farming by 2015. This will bring floriculture under organic farming by default. Flower cultivation is polyhouse based and, therefore, requires less space. Polyhouse is a 250 square metre protective shade of polythene in a steel or bamboo structure. In the past seven years nearly 5,000 farmers were introduced to floriculture and are growing cymbidium orchid, gerbera, lilium, carnation and rose. Dup Tshering, who used to grow native millets and rear cattle, was introduced to cymbidium orchids by the horticulture department along with 20 other families from Pakyong, a small town. Each farmer was given 500 saplings, polyhouse and thorough training. The orchids bloomed within three years. Prompted by good returns, Tshering invested in a second polyhouse. One flower stick fetches between Rs.40 and Rs.70, depending on its length and the number of blooms. 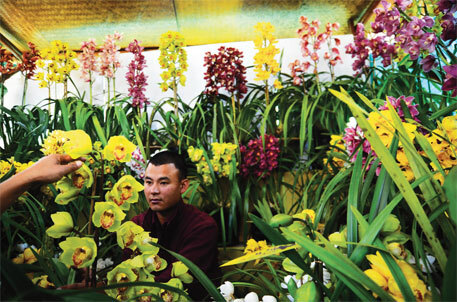 Even though the orchids bloom only between November and April, Tshering made a handsome profit of Rs.80,000 last year. Sikkim produced flowers worth Rs.20 crore last year, no small achievement for a state that has only 600,000 people. 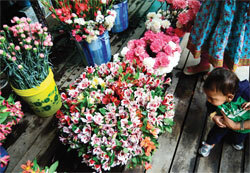 Of the Rs.3,700 crore flower market in India dominated by rose, Sikkim is trying to capture the top end of the cut flower trade with pricey orchids which stay fresh for a month in a vase. At present, cut flowers are being sent to Delhi, Bengaluru, Kolkata and Mumbai, while potted plants are sold in northeastern states. The success is, however, not without challenges. Delivering flowers to faraway markets is difficult. The only route is National Highway 31A, which leads to the rail network at Siliguri and the nearest airport at Bagdogra, both in West Bengal and about four hours from Gangtok. Only about half of the farmers who were initiated into commercial floriculture have agents or are associated with federations which collect and transport produce from farms to markets outside Sikkim. The rest depend on local sales. Bhagya Rai, a hobby florist-turned entrepreneur, has 2,000 orchid plants but he can supply them only during festive occasions. “Taking a taxi to Gangtok is expensive and there is no regular bus service,” he says. According to farmers of a rose growers’ cooperative, only one large agent buys flowers from them. Payments are delayed by months. “Small farmers do not have the logistics and marketing expertise and depend on large growers to sell their produce,” says Laxmi Rai, owner of a 15,000-plant orchid farm. “I help small growers by buying their produce,” he adds. He sells three-fourths of the produce to Mainaam, the largest grower of orchids and lilies in the state which markets 75 per cent of Sikkim’s produce. Rai sells the rest to State Cooperative Supply and Marketing Federation Limited, or SIMFED. In comparison to Mainaam, the share of SIMFED, is negligible. Padam Subba, additional director at the state horticulture department, however, is optimistic. “We use refrigerated transport of Sikkim Cooperative Marketing Federation and are now roping in big growers who are into marketing, to maintain the cold chain. Besides, a new airport in Pakyong, an hour’s ride from Gangtok, is expected to be ready by 2015,” he says. “A variety of flowers, seeds and planting material were brought into the country after liberalisation. The Indian market holds immense potential for growers of high-value orchids,” says Subba. But it is surprising that a state, which is home to 5,000 varieties of flowering plants, over 500 orchid species and 36 types of rhododendrons, is depending on imported breeds to drive its commercial floriculture. Cymbidium varieties are imported from countries like the Netherlands, New Zealand, Australia and Taiwan. Come to think of it, California Pacific, a US-based plants exporter, came all the way to Sikkim to market Cosmopolitan, a dwarf rhododendron. Interestingly, the state tree of Sikkim is rhododendron and the state flower is the orchid Dendrobium Nobile. “We market imported planting material on behalf of foreign breeders and sell them in northeastern states through government tie-ups,” says Hemant Varshney, manager of Sheel Biotech. They buy plants of cymbidium orchid from traders in the Netherlands and New Zealand and sell them in Sikkim at Rs.600 each. The surfeit of imported breeds can be attributed to the country’s late entry into floriculture research. Sixteen years after it was established, the National Research Centre for Orchids (NRCO) in Sikkim, under the Indian Council for Agricultural Research, has not produced any commercial breed of orchid. “Breeding is a long-drawn process,” defends Dwijendra Barman, principal scientist at NRCO. “Foreign breeders started the process at least 100 years ago. Now, they have well-developed mother plant lines through which new hybrids are developed.” It may take 15 to 20 years to bring a successful hybrid into market. “We started only post-liberalisation,” he adds. Many cymbidium orchid varieties travelled with botanists from the foothills of the Himalaya to England more than 150 years ago. These spread across European countries such as Sweden, France and the Netherlands, which do not have native cymbidium species. After years into breeding, the new varieties are now being sold back to India with a premium for breeder’s rights. Sikkim’s horticulture department spent Rs.3-4 lakh over planting materials, polyhouses and training on each of the 2,000 farmers who were introduced to cymbidium orchids. It spent Rs.50,000- 60,000 on 3,000 farmers each for a similar package for growing lilium, gerbera, carnation and rose. Nearly 50 per cent of the amount was spent on imported planting material. Would such an amount be better spent on research in making indigenous breeds commercially viable is the moot point. To make floriculture sustainable for small growers, the state government needs to address the twin issues of expensive imported breeds and the lack of market access. Else, growers may lose interest and next time round, visitor bees will be less ecstatic. This is a good article. As a matter of fact, India is totally dependent on advanced countries for quality and quantity planting materials for developing orchid-based floriculture. The germplasm of orchid hybrids imported do not bear the correct scientific names and their parentage to further improve in India and produce our own hybrids. Trade liberalization policy has made imported planting materials and the the flowers produced cheaper in our market and our farmers are not able to compete with the imported plants and flowers. It is indeed a discouraging trend and requires reviewing our policy to promote orchid based floriculture in India. Very good article Sayantan. Equally informative too. Thanks for bringing into light the picture behind the flower market.